This chapter focuses upon questions of measurement. The chapter uses a range of resources to situate metric power within a longer historical genealogy. The chapter begins by discussing the expansions of systems of measurement and the increasing uses of statistics to know and govern populations. It then uses these historical insights to show that the big data revolution has been under development for a lengthy period of time. It also then uses these historical insights to open up the political dimensions of social metrics. It identifies the mode of thinking that resides behind metrics and which ushers in the expansion of systems of measurement. 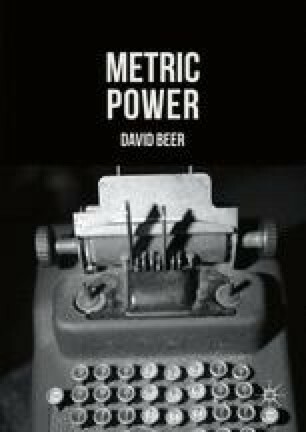 The chapter argues that despite its long history, we have undoubtedly seen an intensification of metrics in recent years. The chapter then focuses upon the case of biometrics to elaborate upon this central observation.